Writer and writer/artist team of Brian Buccellato and Francis Manapul have big shoes to fill in Flash Vol. 3: Gorilla Warfare. 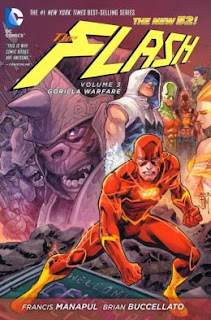 Indeed it was Geoff Johns and Scott Kolins's Grodd story that made many sit up and take notice of what became their classic Flash run, and Buccellato and Manapul have the unenviable task of essentially re-telling the same story, of Grodd running rampant through the Gem Cities. It turns out, Gorilla Warfare is the best of Buccellato and Manapul's three Flash volumes so far, a worthy successor to what came before. Much of what dragged on the team's first two volumes (which were still good in their own right) has been fixed here, suggesting the creators really hitting their stride. Pity the next book is their last, but Gorilla Warfare is a high note to (start to) go out on. While again I liked Flash Vols. 1 and 2, Move Forward and Rogues Revolution, the former focused too much on a contrived and too-convenient long-lost friend of Barry Allen's who just happened to be the villain of the piece, and the latter told its story in a backward fashion that only made sense at the very, very end. Volume 3 is more straightforward in that it boils down to a heroes versus (gorilla) villains story, and also the book makes great use of the Flash's established supporting cast instead of turning to distraction. Manapul's art on this title has always been superlative, and now the book has a story that functions just as well. Indeed, aside from excellent Flash Barry Allen work (good in the "Gorilla Warfare" story, but even better in the two-parter than ends this story), the creative team highlights Flash's supporting cast really well here. Patty Spivot, Darryl Frye, Iris West, and even the new Turbine (a kind of New 52 Top) have roles to play, along with the Rogues, and villain Dr. Elias even affects things behind the scenes. I appreciated that the writers went against type when Patty finds out Barry's secret, and had her pretty well OK with it rather than throwing a melodramatic fit; Patty also shines when she plays cavalry in "Gorilla Warfare"'s last chapter, a moment that serves to really make the audience feel like the characters are at war. In fact, it's really hard not to like Patty, and the writers have something akin to Arrow's Felicity/Laurel triangle here in that we know Barry is meant for Iris, but it's tough not to favor Patty instead. There's an equally wonderful "CW moment" in "Gorilla Warfare"'s conclusion that demonstrates Barry's mixed feelings. Of course, Barry can't be with Iris any more than Clark can be with Lois, else we trip the wire that blows up the New 52, but I tend to wonder exactly how long DC writers can wait before they go there. Clark proposed to Lois 50 issues into the post-Crisis on Infinite Earths universe, and then there were another 240 issues (of the Superman title alone) before DC rebooted the universe. Can New 52 writers wait another 300 issues and 25 years before they get Barry and Iris together? If he's looking longingly at her now, I'd have to say I'm skeptical. There's plenty to like about Buccellato and Manapul's Flash Barry Allen when he sacrifices himself to Grodd, and then again when he gains the upper hand in the Speed Force. But in the book's final two chapters (issues #18 and #19), the writers tell the story of a powerless Barry Allen (see Dial H) using the Rogues' weapons to fight off a mob, and for a bowtie-wearing stiff, he's really, as one character says, a "badass." That Buccellato and Manapul can make Barry, once thought to be DC's dullest hero, a "badass" is a feat indeed. The two chapters also benefit from a Cyborg cameo (great to see Cyborg with some Flash again) and from guest art by Marcio Takara, whose style best matches Manapul's of all the guest artists in the book. Manapul is one of DC's best and most distinctive artists, one they really can't afford to lose. His nine-page spread in the book's third chapter is a superlative achievement, gorgeous in its panelling (though a little tough to interpret). I rather wish DC had reprinted it Mind MGMT-style as an actual fold-out, though there's a thumbnail image at the end that shows it all together. If Manapul can top this in Flash, Vol. 4, that'll be something to behold. This book's bonus material has some of Manapul's "finishes," pencilled and mildly colored pages, and I'd love to see one of DC's "Unwrapped" volumes with more of Manapul's work like this. With the next and last volume, Buccellato and Manapul equally venture into a realm where lightning has already struck twice, a Reverse Flash story, done well once by Mark Waid and then again by Geoff Johns. Given how well Flash Vol. 3: Gorilla Warfare turned out, my bet is that the team can capture lightning in a bottle a third time (to really beat the metaphor to death). At the start of the New 52 run, I really thought Dr. Elias would turn out to be Zoom, but with this book's conclusion the writers have given me two or three more candidates to consider as well; I can't wait to find out what the answer is. We won't have to wait long ... Flash Vol. 4: Reverse coming up next. is there any site that lists all the comics that have been axed in the new 52? The DC Comics New 52 Wikipedia page lists all current and cancelled series by "family".